The outbreak of West Nile Virus (WNV) in and around Chicago in 2002 included over 680 cases of human illness caused by the virus within this region. The notable clustering of the cases in two well-defined areas suggests the existence of specific environmental and social factors that increase the risk for WNV infection and/or illness in these locations. This investigation sought to create an empirically based model to account for these factors and to assess their importance in explaining the possible processes that may have led to this pattern. The cluster pattern of high incidence of cases was statistically significant. The risk factors that were found to be important included the presence of vegetation, age, income, and race of the human population, distance to a WNV positive dead bird specimen, age of housing, mosquito abatement and geological factors. The effect of different mosquito abatement efforts was particularly notable. About 53 percent of the variation of the location of WNV clusters was explained by these factors. The models developed indicate that differential mosquito abatement efforts are especially important risk factors, even when controlling for key environmental factors. Human population characteristics play a role in risk that is measurable in this ecological study but would require further research to associate causality with risk. The analysis of spatial clusters of case incidence indicates that this approach provides more insight into the focal nature of differential risk factors that tend to be associated with WNV than an analysis of all individual cases. West Nile Virus (WNV) was first identified in the United States in samples from infected birds, humans, mosquitoes and horses in and around New York City during the fall of 1999 . Since 1999, the West Nile virus has most probably become established as an enzootic virus with annual occurrence of human cases [2, 3]. West Nile virus is similar to other viruses in the Japanese encephalitis virus complex, which includes St. Louis encephalitis (SLE), which also occurs in the United States. The virus cycles between birds and mosquitoes; while horses, humans and a number of other vertebrates are considered incidental hosts. Elderly people are more susceptible to severe forms of infection and many people infected will have only minor symptoms or remain asymptomatic . While many avian species have tested positive for WNV, only species that develop sufficiently high levels of viremia will promote transmission of the virus to mosquitoes. These are called amplifying hosts. The enzootic transmission cycle is essential for the virus to spread, and human proximity to this activity is necessary for transmission to humans. During the summer of 2002, WNV became established in the Chicago area. The number of human cases in Illinois was the highest of any state during 2002, with 884 cases and 66 deaths . The virus was first noted in the area in late August, 2001, when birds in the family Corvidae tested positive for the virus , following its spread through states to the east by 2000 . No human cases were documented that year as the first bird cases appeared late in the mosquito season. The outbreak in 2002 was notable and "was the largest arboviral meningoencephalitis epidemic documented in the western hemisphere and the largest reported WNME epidemic"  up to that point in time. In 2003 there were even higher numbers nationwide, with 8,567 human cases, but Illinois recorded only 53 cases [5, 9]. Prior efforts to delineate high-risk areas for WNV exposure to humans have focused primarily on the measured presence of WNV-positive bird specimens. A bird that has tested positive for WNV can be an indication that human cases will occur there, too [10–13]. In United States examples, vegetation and temperature variation have also been used in an attempt to explain the disease pattern [14, 15]. In Old World outbreaks, highly endemic areas have been characterized as relatively "dry" but in close proximity to wetlands and bird habitats [16–18]. In Egypt, human population density was greatest in high intensity areas and mosquito abundance was higher than in non-endemic places . The present investigation extends the assessment of spatial variability of risk beyond these factors to assess the contribution of social, demographic and natural features that resulted in some places being foci of WNV in humans while others were not. Since the mosquito vector will stay in a very small area provided habitat and blood hosts are available, these spatially constrained areas are of considerable interest both in terms of the enzootic cycle and transmission to humans . The analysis was carried out for an area in and around Chicago, where a strong spatial clustering was observed in human cases at the local level during the 2002 outbreak. The notable clustered pattern of WNV cases in this region and the apparent association with broad natural features based on topography and soil characteristics points to the existence of specific localized factors that contribute to virus amplification and disease transmission (Figure 1). The amplification occurs in the avian reservoir host, and it is when virus amounts are sufficiently high that transmission to humans occurs. 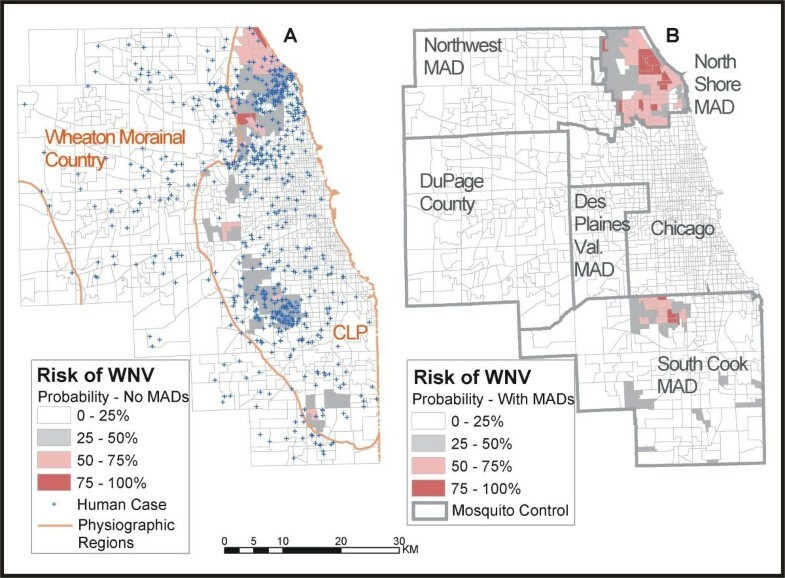 This analysis determines associations of key aspects of the urban ecology, including housing, environmental, and population characteristics with the spatial variability of human cases of WNV during a significant outbreak. This will help to illuminate the effect of place on the health of urban populations, and will contribute to the understanding of spatial heterogeneity and its effect on disease patterns . 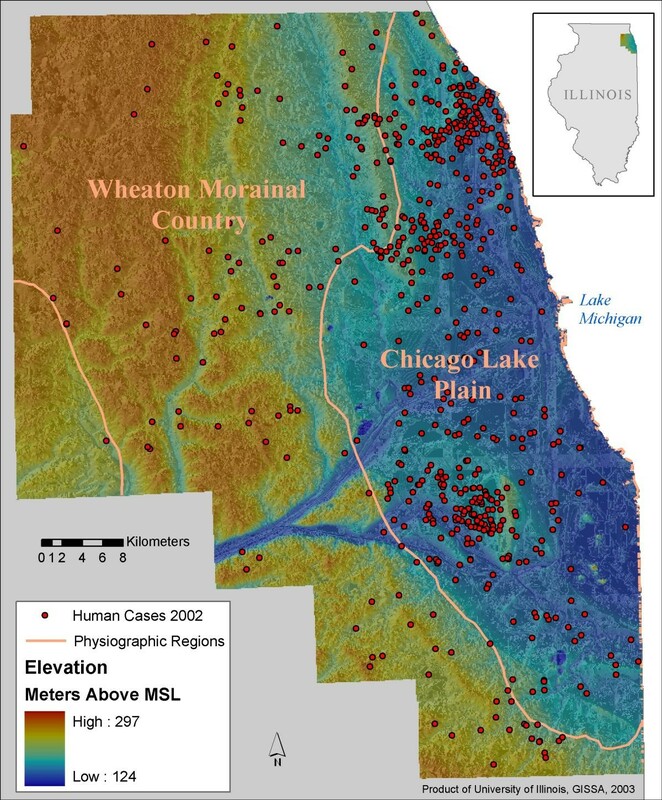 Map of Cook County and Dupage County, IL, with human WNV cases and topography Point locations of residences of WNV human cases in 2002 are shown in relation to elevation and physiographic regions of the area. There was concern during 2002 that mosquito control was not consistent across the region and that this contributed to the clustering of cases . In this region the Culex pipiens mosquito is of special concern as a key WNV vector species. Mosquito control in the two-county area comes from six main sources. Four Mosquito Abatement Districts (MADs) exist in Cook County: North Shore, South Cook, Des Plaines Valley and Northwest MADs. In addition to the MADs, which are independent taxing bodies, the villages in DuPage County handle abatement and the city of Chicago, in Cook County, oversees control for the parts of its jurisdiction that are not within a MAD. The MADs are credited with enabling economic growth in the area during the early 1900s by reducing the health risks associated with mosquito-borne diseases. But more recently, until the WNV outbreak, control of flood water mosquitoes had taken center stage, with the nuisance factor playing a larger role than disease. 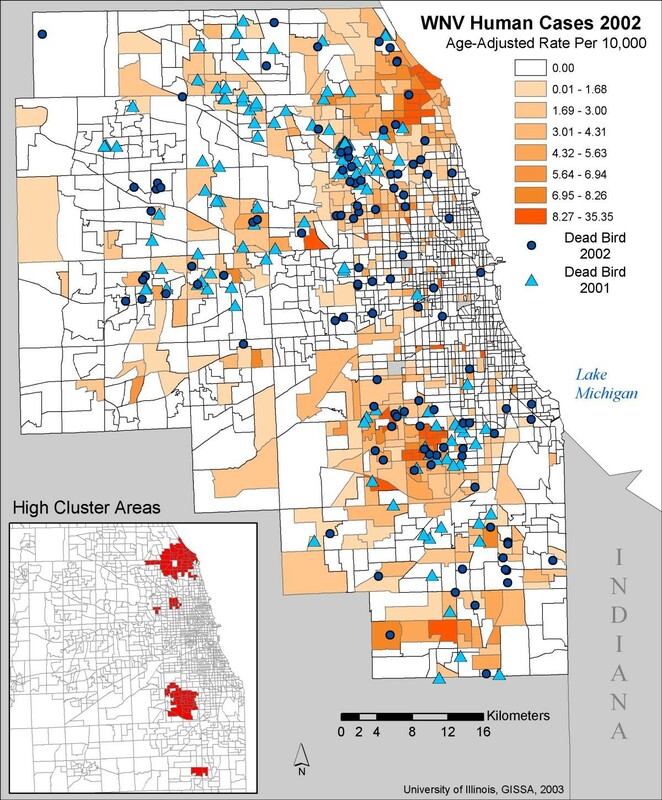 We examine two questions related to factors that are specific to the Chicago area WNV outbreak of 2002, an outbreak characterized by naive host populations and an exotic pathogen that became established in a new location. First, we address the question: what are the social and environmental conditions that distinguish places where WNV was manifested in human cases from places where it was not present within the two-county study area? In addition, we seek to define the conditions that distinguish places with high focused incidence of human cases from places where few or no cases were reported. The analysis of cluster areas, or "hot spots," may indicate a local focus of the enzootic processes that contribute to virus transmission to humans. The study area comprises the counties of Cook and DuPage, Illinois, which make up the core of the Chicago urban area (Figure 1). The two-county study area was chosen because of compactness, the ease of definition and to include the most highly populated and most affected areas in the 2002 outbreak. About 77% (683/884) of the 2002 Illinois cases occurred in these two counties. All data were summarized and analyzed at the census tract level. A variety of factors considered important to understanding WNV risk to humans were included in the analysis (Table 1). These are described more fully below. There are 1,481 tracts in the area of interest. The social, housing and environmental variables considered. All factors were summarized at the census tract level for the two county study area. Data for human cases and bird specimens in the state of Illinois for the year 2002 are from the Illinois Department of Public Health. The residential address of each human case was used to geocode the cases to the street level. Of the original 884 cases, 64 had incomplete or incorrect addresses and could not be geocoded to the street level. Of the remaining 820, 649 cases were located in Cook or DuPage counties and were used in this analysis. The age of each case was used for a direct age-adjustment of the data at the census tract level (Figure 2). In the age-adjustment, the incidence rate of cases by tract is adjusted to reflect the rate that would be present if the age distribution in each tract were proportionally the same as a standard distribution that reflects the United States population at large. Since WNV tends to afflict older people more often and to cause more serious illness in people over age 50, the age-adjusted rates provide a pattern independent of the age structure. Map of age-adjusted WNV rates with locations of dead bird specimens The age-adjusted rates were calculated by census tract. The point locations of the dead birds are approximate locations of the specimens found during 2001 and 2002 and tested positive for WNV. Data on bird specimens that tested positive for WNV in 2001 and 2002 were geocoded using address or street intersection information. In cases where a park or public area was listed for the location, a point was estimated. In 2001, 123 bird specimens tested positive in the two-county study area. In 2002, 118 positive specimens were found in the study area. The great majority of the birds were corvids, specifically either blue jays or crows. These birds were found dead and reported by citizens to the county or city departments of public or collected by public health personnel. These die-offs were a striking feature of the outbreak and have received considerable attention from both the media and the scientific and medical community concerned with WNV surveillance . The number of meters from the tract centroid to the nearest WNV-positive bird specimen was measured for each tract to determine the extent to which human incidence was related to the location of the bird specimens. Factors related to human population included household income, population age, race, age of housing, housing density, and population density. Data for these are from the United States Census of Population and Housing for 2000 . These variables were included in the analysis to build a descriptive model of the areas with WNV. In addition, site visits to the most affected areas, discussions with public health personnel in the region, and the epidemiology of SLE indicated that these factors would be of some importance in understanding WNV risk. A number of factors related to the physical environment were also included. The elevation range and average for the tract, physiographic region, and percentage of area covered with vegetation were all considered. The Chicago Lake Plain physiographic region was of particular interest. Physiographic regions are defined by common characteristics in geology, soils and drainage systems. This area of poorly drained clay soils with less than 15 meters difference in elevation follows the contours of the Lake Michigan shoreline. It was formed by the retreating glacial Lake Chicago during the Pleistocene, 12,000 years ago. Low, flat, vegetated areas were considered better habitat for mosquitoes and birds and would thus be expected to increase risk for WNV. The data for these were obtained from the state of Illinois Department of Natural Resources. The MAD boundaries were used to delineate areas with relatively consistent control strategies during the outbreak. The MAD boundary maps were received in digital form from the IDPH. Using these maps along with phone conversations with MAD personnel and printed materials from the MADs, each tract was assigned to one of the MADs, to the City of Chicago or to Dupage County for the purpose of mosquito control. A local Moran's I measure of spatial autocorrelation, known as the Local Indicator of Spatial Association (LISA) was used to distinguish clusters of cases, or "hot spots," from cases that occur outside the focal areas . It was calculated from the age-adjusted WNV rates per 10,000 persons using the ClusterSeer software program . The LISA and a probability value were measured for each tract. A positive value indicates tract values of similar magnitudes that are adjacent to each other, while negative values indicate dissimilar values relative to adjacent tracts. The epicenter tracts for WNV are defined here as those with significantly (p < 0.05) positive LISA statistics. These all occurred in tracts with relatively high rates of WNV cases and there were no clusters of low values. Eighty-three tracts of the total 1481 tracts (5.6%) are in the WNV focal areas (Figure 2, inset). A step-wise discriminant analysis was used four times to predict group membership in a tract with WNV. First was a comparison of the tracts with cases to those without cases relative to the set of environmental and social factors. The second compared tracts in a cluster to those outside. In the third and fourth analyses, the MAD variables were included as dummy variables to assess the importance of mosquito control relative to other factors. Following the discriminant analyses (DA), binary logistic regression models were developed with the discriminating factors identified in the DA as independent variables. The probability of a tract being at risk was calculated from the regression equation and maps of WNV risk were created. The average disease frequency across all tracts for the two counties is 1.035 per 10,000 persons, with 376 tracts having at least one case of WNV. The spatial pattern of both the human WNV cases and the locations of the positive bird specimens are indicative of a non-random pattern (Figure 2). The two most notable areas with a high concentration of human cases are in the north part of the study area near the cities of Skokie and Evanston and in the south, around Oak Lawn and Evergreen Park. Two lesser focus areas are found in the northwest part of the city of Chicago south of the Skokie cluster and in the far southern part of Cook County, near the city of Chicago Heights. The global Moran's I (I = 0.24266, Exp = 0.000676, p = 0.002), confirms that the pattern of the values of age-adjusted human WNV rates are non-random. In the local spatial clustering measures, the tracts with LISA values of p < 0.05 are located primarily in the two most notable concentrated areas (Figure 2, inset). The first discriminant analysis compared tracts without any human cases of WNV to the tracts that had at least one case in Cook and DuPage Counties. The results reveal that a tract is more likely to include at least one case when it has lower population density, is relatively close to bird specimens, comprises a higher percentage of older and white residents and has a higher percentage of housing built between 1950 to 1959 (Table 2). The most important variable is the distance to a dead bird, but the effect of race and housing age are almost equally important in discriminating between the two groups of tracts. DA results for tracts with at least one human case of WNV compared to the tracts without cases. The five variables are significant at the .001 level using the Wilks' Lambda test to enter the variable in the model. The Eigenvalue is .160 and the Canonical Correlation is .372 for this model. The second discriminant analysis considered the differences between tracts inside or outside of the identifiable clusters. The five significant variables in the first analysis are also important here, but the differences are more discriminating (Table 3). In addition, the two environmental factors related to the location of a tract in the Chicago Lake Plain and the amount of vegetation in a tract were significant. That a tract be within the Chicago Lake Plain region is the most highly discriminating factor in this model. Also striking is the more focused importance of race. The population within clusters was, on average, 82% white, compared to 52% white population outside, which is about average (54%) for the study area. The minimum distance to a bird specimen in this analysis is 33% lower (895 vs. 1426 m) than the distance from all tracts with a case in the first discriminant analysis. The overall model of clusters vs. non-cluster tracts is more discriminating than the first model with the Eigenvalue increasing from .186 to .236 when clusters are modeled. DA results for tracts in identifiable clusters compared to the tracts outside of the cluster tracts. The seven variables are significant at the .001 level using the Wilks' Lambda test to enter the variable in the model. The Eigenvalue is .186 and the Canonical Correlation is .396 for this model. When the MADs are added to the other factors, the discriminant analysis reflects the relative risk of a human case of WNV given the approach to mosquito abatement practiced (Tables 4 and 5). In both the analyses, the MADs prove to be significant factors. The location of a tract in the North Shore MAD is the best discriminating factor for both instances. The tracts in the North Shore MAD (northernmost) are at much higher risk than those outside, as are those in the South Cook (southernmost) MAD. In the third, but not the fourth analysis, a tract in the DesPlaines Valley MAD (center and to the west of the downtown area) had a reduced probability of having a case even in those tracts with otherwise favorable environmental factors. In the third model, the addition of the MADs left three of the other variables intact (bird distance, race, and housing unit density) and excluded median population age and age of housing. The Chicago Lake Plain was important in the model for tract clusters with or without MADs, but especially when the MADs were not included. The best (most discriminating) model is the fourth, which includes the MADs and analyzes the clusters of cases (Table 5), with the highest Eigenvalue of .392. From these results, it was determined that the more robust models were for the clusters of tracts. These clusters were of special interest given the biological factors related to amplification and the enzootic cycle, and the models of clusters were developed further. DA results for tracts with cases compared to tracts without cases and with MADs. The six variables are significant at the .001 level using the Wilks' Lambda test to enter the variable in the model. The Eigenvalue is .236 and the Canonical Correlation is .437 for the model. DA results for clusters compared to the tracts outside of the cluster tracts with MADs included. The six variables are significant at the .001 level using the Wilks' Lambda test to enter the variable in the model. The Eigenvalue is .392 and the Canonical Correlation is .531 for the model. Two logistic regression equations were developed and used to calculate the probability that a tract would be in a cluster. The models initially used the factors that were statistically significant in the DA. The first logistic regression model, without MADs, was not in total agreement with the DA, as the vegetation variable was dropped when it proved to not be significant. All of the remaining coefficients were significant at the .05 level and the R2 was .391. A risk map of probabilities calculated from the model reveals the pattern of the high-risk areas (Figure 3A). The places with characteristics that are associated with a greater risk for being in a WNV focal area are outside the central part of Chicago but within the Chicago Lake Plain region. The tracts with the highest probability of being a WNV human risk area (given the tract characteristics measured) were in the far northeast part of the study area. Figure 3A: Map of the probability of WNV focal area without mosquito abatement areas.. The probability of a tract being in a WNV cluster is based on logistic regression. The human case point locations are provided for reference. The equation for this model is Y = -10.607 + (2.732 * LK_PLAIN) + (.034 * PCT_WHITE) + (.085 * MED_AGE) + (.020* PCT_HOUSES50-59) + (.0001 * MED_INC) - (.278 * HOUSE_KMSQ) - (.0001 * DIST_BIRD). Figure 3B: Map of the probability of WNV focal area with mosquito abatement areas. The outlines of the mosquito abatement areas are considered approximate and are drawn from the best information available at the time of writing. The area marked as "Chicago" indicates that area for which the City of Chicago oversaw the mosquito activities during 2002. This is not to be considered the metropolitan outlines of the city. The equation for this model is: Y = -6.575 + (4.025 * NSH_MAD) + (.049 * PCT_WHITE) + (2.387 * SCK_MAD) + (1.201 * LK_PLAIN) - (.114 * ELEV_RANGE) - (.0001 * DIST_BIRD). When the MADs are added to the model, the pattern is markedly different (Figure 3). Again, this model was not in total agreement with the DA, as the housing unit density variable was not included. All of the remaining coefficients were significant at the .05 level and the R2 was .532, making this model a considerable improvement over the one without MADs. The risk map of probabilities illustrates the highly contained areas that were at greater risk for being in a cluster of WNV, when taking into account the variable nature of the vector control that occurred during the 2002 mosquito season (Figure 3). This second pattern illustrates the extent to which variable mosquito control will bias attempts to draw firm conclusions about where the risk for WNV is highest based on the outcome from 2002. The focal areas of WNV are distinctly different from the rest of the region, so the identification of the factors that characterize those places provides insight into human risk and helps to target control and amelioration strategies. Based on the analysis, the pattern of tracts with clusters of cases of WNV in 2002 may indicate several different underlying processes. First, clusters may be near a common source of infection, where tracts are in places with conditions that are especially well suited for viral transmission. Second, the clusters may be related to concurrent socio-economic conditions that are reflected in lifestyle or that may make some people more likely than others to visit a doctor and thus be counted as a case. Third, the clusters may occur where mosquito control was not sufficient. In the first instance, the cluster tracts are located where people were close enough to an avian host to have been infected by a WNV positive mosquito. The type of environment in which people live is partly defined by the landscape and housing characteristics. Environmental factors are sometimes overlooked in considering the health of urban areas . Of special interest here is the Chicago Lake Plain physiographic region. The poor drainage in this region has led to extensive engineering to improve the runoff of water in the region. The solutions for this were not always engineered when the houses were built. Housing built in the post World War II era, for example, suffered from a general inattention to this issue, and residents noted that ameliorative back yard catch basins were built post hoc to reduce backyard and basement flooding. These catch basins, rich with organic material after many years of neglect, likely proved an excellent breeding ground for Culex mosquitoes in these areas during the summer of 2002. Social factors are very complex and are related to environmental factors as well as to a possible bias in case locations. People without insurance or who are unaware of the possibility that flu-like symptoms might be WNV fever may be less likely to visit a doctor to be diagnosed with the milder forms of WNV illness. This bias may be reflected in the locations of the cases and may play a role in the identifiable clusters. The dead bird specimens may also be biased toward more collection in areas of higher socio-economic populations. In the absence of serosurveys of humans and birds, the true location of WNV may not correlate with the pattern of reported cases. This is an inherent limitation of a passive surveillance system and ecological analysis for understanding human disease risk. It is also possible that the social factors of race and income are only associated with the outbreak indirectly due to their correlation with environmental factors, or there is a real increased risk from behaviors that are linked to lifestyle. Social and environmental factors are interrelated making it more difficult to create a clear and concise model. Population density is inversely related to green space for example, and higher income whites are more likely to live in places with more vegetation, and the presence of vegetation is needed for mosquito and bird habitat. The human demographic variables are related to general risk behaviors. Older people working in their yard or garden in the evening would be an example of a high-risk behavior that may be apparent in the model where older populations and higher amounts of vegetation are risk factors. The specific importance of race was notable in the models of risk for WNV and warrants further exploration. By way of comparison, SLE epidemiology has also brought out a potential link to race. In particular, it has occasionally been found to have limited clinical expression among those who had been exposed to another flavivirus, an exposure which was related to race in the SLE outbreaks in Tampa in 1959, 1961, and 1962. There, it was found that African Americans had been more often exposed to dengue during the last outbreak in 1934 . Perhaps the older African-American population in the study area, especially that portion which migrated from the south part of the United States, is less susceptible to WNV for similar reasons. This possibility and any link to genetic predisposition require further investigation. The effect of living in one MAD versus another was important in the models, but the reasons for these differences are not clear from the available data. The North Shore MAD is almost entirely within the Lake Plain region, for example, so the environmental conditions were highly favorable for the outbreak. The higher income of that area also may have been a factor in more cases being reported, while at the same time may have resulted in more outspoken protest to mosquito control efforts, making more obstacles for efficient and early control. On the other hand, the DesPlaines MAD appears to have had an ameliorative effect on the outbreak despite including areas where social and environmental factors are similar to the North Shore, pointing to the possibility of effective strategies to overcome obstacles. Some methodological considerations are also warranted. The location of cases at the place of residence was based on the fact that Culex pipiens mosquitoes are crepuscular feeders, and are most likely to come in contact with people while they are at home during the evening hours. It was assumed in this analysis that the virus was transmitted near a person's residence, but this may not be true in every case. By using the clustered areas instead of all cases of WNV, the effect of random locations was minimized. A model for an area that was defined differently or one that included a more environmentally concise region would have different results. The effect of vegetation would be different, for example, if downtown Chicago was excluded from the analysis. The fact that the models for clusters were more discriminating than those for all tracts with cases indicates that future work on assessing the risk to humans based on the underlying biology of WNV transmission may benefit from a focus on those clusters. The introduction of WNV into the Chicago area in 2002 is a situation that is not likely to be replicated in the future. The MADs have now adjusted strategies to better control Culex species mosquitoes and coordination of efforts and the recognition of the importance of this coordination are positive outcomes of the 2002 outbreak . While the ongoing risk of WNV to human should not be disregarded, the natural immunity of the human population most likely has increased and the susceptibility of birds has been reduced either through drastic reduction in numbers or acquired immunity, so the number of cases in the near future will be less than would be seen in a naive population. Improved surveillance of key avian and mosquito species across the metropolitan region as well as vigilance in reduction in breeding grounds will have a significant impact on reducing the risk for WNV in humans. Places where urban development occurred during the rapid growth of the 1950s may benefit in particular from greater attention to reducing breeding habitat. This analysis of the spatial patterns of WNV human cases resulted in many further questions rather than firm conclusions. The reservoir hosts and vectors are the keys to pinpointing hotspots and will be the focus of future work. Because the systematic data collection needed to detect the timing, intensity and location of viral activity did not occur across the study area for 2002, this aspect of the disease ecology is limited to the bird specimens available. The assessment of risk of WNV to humans cannot be made outside of the context of the urban environment in which it is present. It is clear that the propensity for the virus to be present in some places is greater than for others, but the effect of mosquito control also is apparent. Further research in the response of residents to the risk WNV and a qualitative assessment of the political and social factors related to mosquito control will also be carried out. Mosquito control combined with appropriately targeted health education outreach are key factors to reduce the risk of WNV to humans even in areas that are environmentally predisposed to harboring the virus and these broadly defined factors also should be included in future models. The Illinois Department of Public Health provided funds to carry out this analysis. MOR carried out the statistical analysis, supervised the data processing and map production, and drafted the manuscript. UK participated in the design of the study, interpretation of the results and in drafting the manuscript. CT created the maps and processd the geographic data prior to analysis. TJM geocoded all cases and assisted with the data processing. CA gave information about data collection procedures, provided data access and coordinated feedback from public health officials on the results.